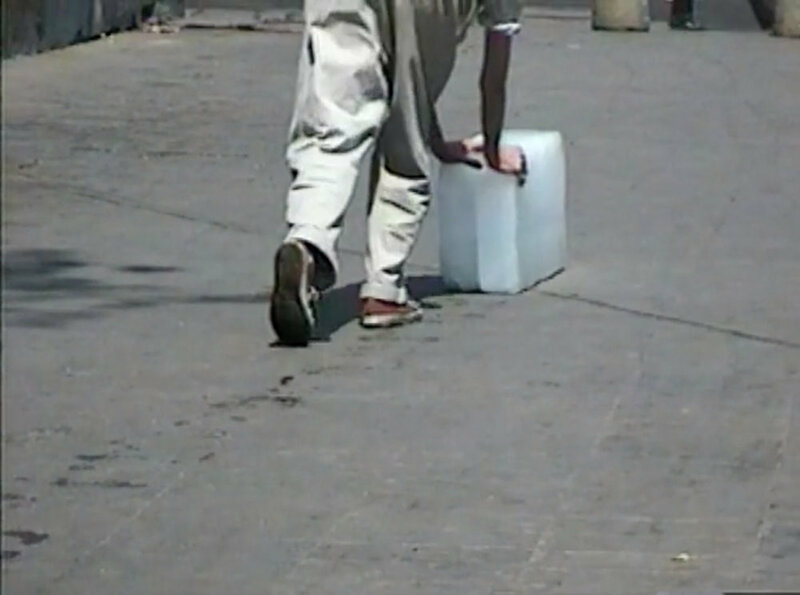 Paradox of Praxis 1 (1997) is the record of an action carried out under the rubric of “sometimes making something leads to nothing.” For more than nine hours, Francis Alÿs pushed a block of ice through the streets of Mexico City until it completely melted. And so for hour after hour he struggled with the quintessentially Minimal rectangular block until finally it was reduced to no more than an ice cube suitable for a whisky on the rocks, so small that he could casually kick it along the street. Throughout his practice, Francis Alÿs consistently directs his distinct poetic and imaginative sensibility toward anthropological and geopolitical concerns centered around observations of, and engagements with, everyday life, which the artist himself has described as “a sort of discursive argument composed of episodes, metaphors, or parables.” His multifaceted projects including public actions, installations, video, paintings, and drawings­ have involved traveling the longest possible route between locations in Mexico and the United States; pushing a melting block of ice through city streets; commissioning sign painters to copy his paintings; filming his efforts to enter the center of a tornado; carrying a leaking can of paint along the contested Israel/Palestine border; and equipping hundreds of volunteers to move a colossal sand dune ten centimeters. Francis Alÿs (Belgian, b. 1959) Work by the artist is found in public collections worldwide, including the 21st Century Museum of Contemporary Art, Kanazawa, Japan; Art Institute of Chicago; Hammer Museum, Los Angeles; Musée d’Art Moderne de la Ville de Paris; Musée d’Art Moderne Grand-Duc Jean, Luxembourg; The Museum of Modern Art, New York; Philadelphia Museum of Art; Pinakothek der Moderne, Munich; Solomon R. Guggenheim Museum, New York; Stedelijk Museum, Amsterdam; and Tate Gallery, London.